How Serious Is Tony Parker's Back Injury? Tonight, Tony Parker will likely miss his third straight game with a back injury, and more than a few assume that Parker's "injury" is really just a cover for Gregg Popovich to rest his star before the playoffs. The injury, tweeted April 7th from the Spurs' official account as "a sprained facet joint, left side," sounds like the kind of thing you might make up. But assuming the sprain is real—and we have no evidence to suspect it's not—let's take a look at what the injury means for the six-time NBA All-Star, and San Antonio's chances in the playoffs. Broadly speaking, the facet joint connects vertebrae and allows the spine to have flexibility; without it you'd have trouble swinging a golf club or touching your toes. When the joint is sprained, movement is still possible, but it's quite painful and range of motion can be severely limited. Although you probably haven't heard much about it, the joint is thought to be responsible for chronic lower back pain in up to fifty percent of people. Someone with a sprained facet joint may experience a sudden onset of sharp back pain during exercise and it's common to have significant stiffness and discomfort the next morning. Symptoms are typically felt on one side of the spine (for Parker, it's the left) and muscle spasm can happen around the affected joint. Occasionally, soreness may travel into the buttock or leg on the affected side. A serious sprain can leave someone with a severe limp. Symptoms are generally exacerbated by activities that involve twisting, lifting, arching backwards, or bending forward. In other words, professional basketball is basically the worst possible rehab you can imagine. Where exactly is his injury? A quick refresher for those not well versed in spinal anatomy: The spine is made up of thirty-three vertebrae; nine are fused to form sacrum and coccyx, and twenty-four are connected by intervertebral discs, ligaments, and joints. This unfused, flexible region of the spine is further divided into three different parts: cervical (near the neck), thoracic (chest), and lumbar (lower back). The Spurs haven't revealed which part of Tony Parker's spine is injured, but Manu Ginobili recent said of his teammate, "He was just sore in his lower back" which means it's probably an injury to a facet joint in Parker's lumbar spine. In that area, the joint functions to protect the spine from excessive rotation and flexion, as well as anterior sheering forces, but it has little influence on the range of side bending (lateral flexion). Actions like diving for a loose ball or lunging for a rebound or Euro-stepping a big man out of the gym a will place stretching or compressive forces on the facet joint, and if the stress is beyond what the facet joint can withstand, damage to the cartilage or connective tissue surrounding the joint can occur, resulting in a facet joint sprain. It's unclear if any one play caused Parker's injury or if a series of events compromised the strength of the joint. The playoffs start next week. Aside from rest, what can be done about the Parker's injury? There are two general approaches to the treatment of a facet joint sprain, conservative and aggressive. Conservative treatment includes a course of oral anti-inflammatory medication (Advil or Motrin), physical therapy, spinal manipulation, and most importantly, rest. But because the west is a disaster this year, the Spurs probably can't afford to rest Parker much in the first round, even as the 1-seed. The other, more aggressive approach involves interventional procedures like corticosteroid injection into the lower back to reduce inflammation and medial branch blocks, which disrupt the nerves that feed out from the facet joints in the spine and carry pain signals to the brain. Yet another interventional option is radiofrequency neurotomy, which utilizes an electrical current to cut the medial branch nerves to reduce pain emanating from the facet joint. This procedure causes temporary degeneration of the nerves and is usually only employed to relieve severe discomfort. Most doctors begin with conservative treatment, hoping that the pain and inflammation will subside with rest, ice, Ibuprofen, and perhaps a dip in the hot tub. But if that fails, the Spurs team physician will inevitably look to a more aggressive approach, but which option is best? Steroid injections? Nerve blocks? Radiofrequency ablation? 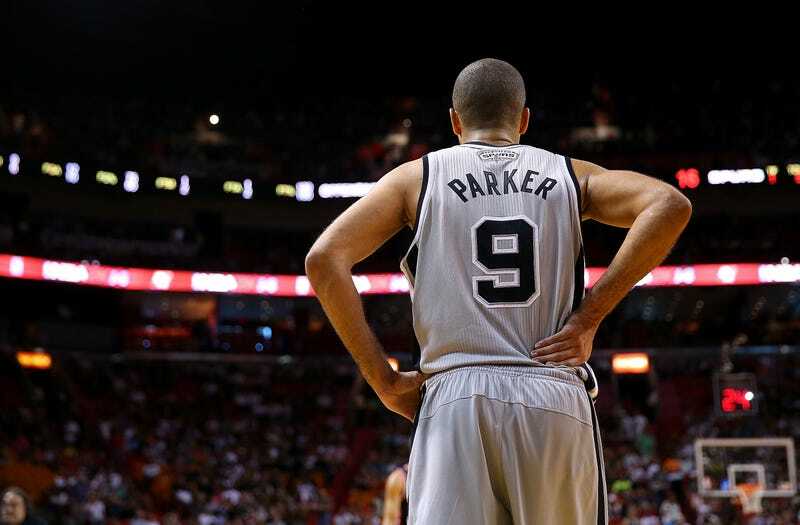 And what will any of that mean for Parker's return for the playoffs? In one study, performed at the hospital where I work, doctors prospectively looked at the role of radiofrequency denervation in athletes with lower back pain. Like Tony Parker, the subjects had documented facet joint inflammation by MRI. All of the athletes (all were baseball pitchers) were initially given steroid injections into the lumbar spine to treat their pain. Eight weeks later, however, all still had persistent discomfort of the facet joint and all subsequently underwent nerve blocks, and each patient experienced a positive result. Then they all underwent a radiofrequency denervation along with a physical therapy program. All study subjects reported a significant improvement in pain and 83% of the athletes said they were able to return to playing at the same pretreatment level. For Parker, this would be ideal. The authors of the study concluded that following accurate diagnosis of facet-mediated back pain, lumbar facet joint radiofrequency denervation was an effective, safe, and long-term pain reliever. Whether this finding in pitchers is applicable to a point guard is debatable, but it's certainly an encouraging finding. Parker has reportedly received an injection into his back, but it's unclear what medication he received. When will Parker be ready to play? It's notoriously difficult to prognosticate after a back injury. Some basketball players make a quick and full recovery while others are plagued by nagging pains for decades. Tony Parker's injury does not appear to be a particularly serious one—Popovich hopes to have him back in time for the playoffs—but the NBA experience is brutal and the postseason schedule is unforgiving.